... late June back in 2010, what a very special time for me, 'cause I'll remember what a night. OK, so a spot of altering of the Frankie Valli song, but a very memorable night has been had! Saturday 26th June 2010. 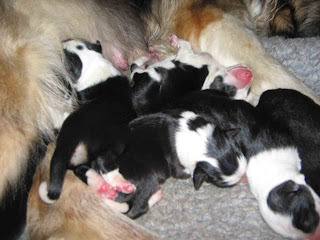 The very much planned, prepared for, etc, etc, arrival of the Cafe Latte Girl's puppies has finally happened. 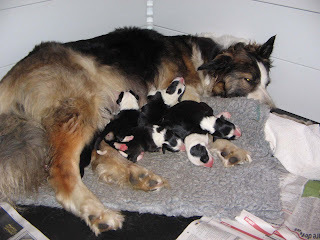 The first pup born at 3.30am, and the sixth pup born at 8.22am. Are there more? Well, aye, we think there are! The Cafe Latte Girl has been a fabulous first time mum, she has been extremely calm throughout. Her foetal fluids have been clear, indicating there is no puppy stress, and she’s just been a natural. So far we have 3 boys and 3 girls. How well balanced is that? My breeder friend Sue has been sat up with me all night during the births ... shame she missed the first one!! It’s been an interesting but tiring night. The bizarre thing is we were both Twittering live broadcasts of what was happening with accompanying photos of the pups as they arrived. That caused some interest around the world with people in different time zones asking if the next pup had made an appearance. Bizarre these time zones and the world of Twitter! As it turns out there are only the 6 pups. Whilst Sue and I felt what could have been a head to a pup, and then a distinct line as if the pup had turned, there wasn’t another one. I had intended to wait a few weeks before taking the pups out on their first journey in a vehicle, but what the heck, they’ve been out to my Vet on day 1! Eight hours after the arrival of the sixth pup, I decided to get the Cafe Latte Girl checked, so we all arrived at the Vets at 6pm. There was a concern that if a pup was delivered during the night there might be complications, so much better safe than sorry. Expecting to just have an injection of Oxytocin to induce more contractions, she had a scan. The vet could feel the same mass Sue and I could feel but it wasn’t conclusive on the scan, so decided to x-ray her. CLG was so good, she was put onto the x-ray machine, told to stay in a flat position, sand bags placed across her shoulder and her legs and the x-ray was taken with no sedative. It confirmed that CLGs first litter was the fabulous 6. Mum and pups travelled extremely well, in fact Mum didn’t appear to think anything much of it at all. It’s been a long night and day, and a very happy one. Time for a well deserved nap, for everyone. You will have to update blog every week now so we all know how this lovely family are progressing. They are beautiful pups and have a great sensible natural mother .Just like her own mother who has passed the maternal instincts on very well. Congratulations on a well deserved sucess for your first litter. My alarm has been set for weekly updates and thanks for congratulations and your help in it all ... even if you did miss the first pup popping into the world! !